Glen has a distinguishable bold design style featuring wonderfully threadlike lines. He explains that he has been elected as Yam Island’s ‘official’ storyteller. Glen’s mission is to keep alive the sacred stories of the four brothers who travelled from the north before memory and settled at Zenadh Kes, or what most Australians know as the Central and Eastern Torres Strait Islands. In Glen’s works, art and law are combined heroically – the figures are woven into rhythmic patterns of design. Paintings, prints and sculpted objects by Glen are held in numerous private and public collections nationally. Awai is a pelican in the Kala Lagaw Ya language, of the central Torres Straits. For some reason the awai in the Torres Strait Islands are bigger than the awai on the mainland. This is the tiger shark hunting its favourite food, the waru (green turtle). If you see this take place in the ocean you’re very lucky as I’ve only witnessed it once. It’s like they’re dancing, with their swift manoeuvres through the water. I am trying to capture their movements in this image. 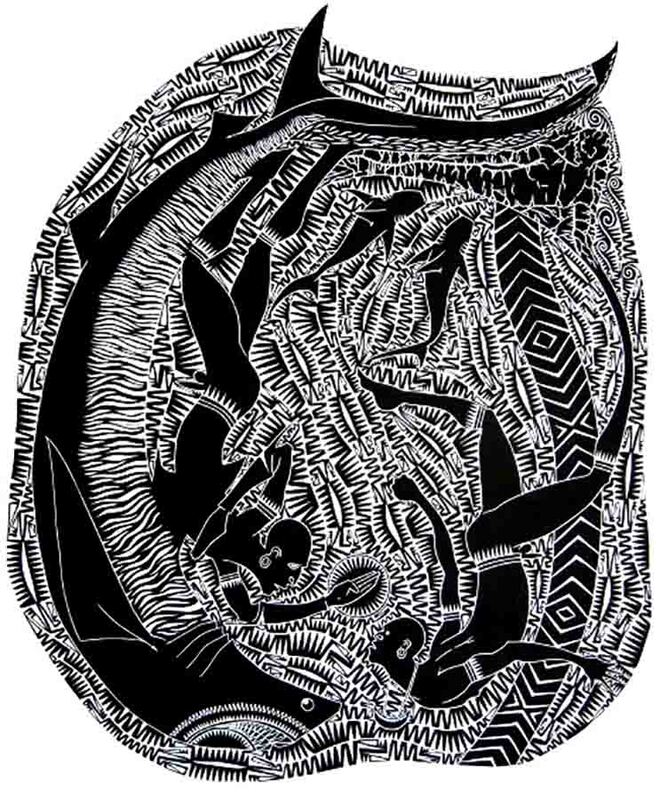 Before setting out on a hunt, men would rub dugong oil on the doiom (stone) to give them zogo (power) and good luck for the hunt. Instead of looking for the dangal (dugong), the dangal would come to them. The stone was always tied at the front of the canoe during the hunt. The githalai (mud crab) is one of our most precious food sources. It lives in the mangroves where we catch them using traditional hunting tools. The methods for catching Githalai haven’t changed for centuries. This has always been a favourite food of Torres Strait Islanders, especially those on pearling boats. 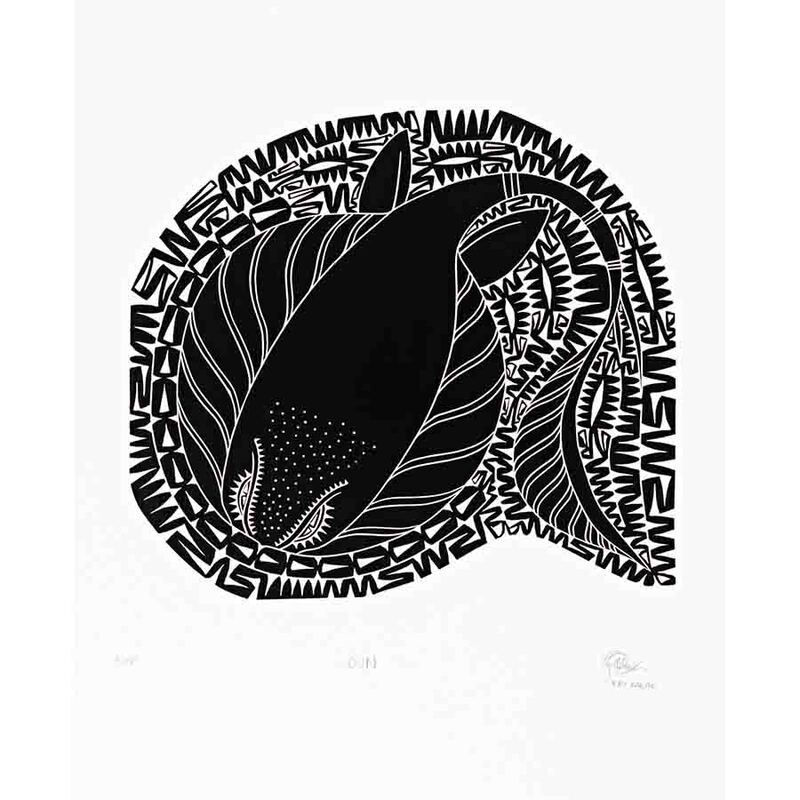 This print is based on my Uncle Kobo Kebisu (Jacob Kebisu). He was the best diver on Yam (Iama) Island in the Torres Straits. He could hold his breath for five minutes while diving for kaiyar (crayfish). I have incorporated my uncle’s face in the body of the crayfish. At low tide one morning, a man walking the reef at Gebar (Two Brothers Island), noticed sea grass, nipped off short during the night by dugongs. Wanting to catch one of them, the man hurried home to tell his wife and prepared for hunting. He cut six long mangrove poles for a free-standing fishing platform called a nadth, erecting it near the sea grass bed where the dugong had previously been feeding. He then collected a long single length of vine as a harpoon rope. He laid the harpoon and spear on his nadth and waited for nightfall. As soon as it was dark, he lit a small fire on the beach and when the tide rose, swam straight out to the nadth, then waited for the dugong to come and resume feeding from the previous night. Glancing at his fire on the beach, he saw Kawai the wicked black dogai (witch), standing luridly beside it. He watched in horror as she turned her head from side to side, peering out at the reef, trying to locate the dugong nadth. She was looking for the hunter - himself!! Noiselessly, he picked up his harpoon and spear, slid into the water and swam, unnoticed, as fast as he could towards a rocky point. On the other side, out of Kawai’s sight, he went ashore and ran home. He woke no one, going straight to his sleeping mat, cowering inside. For a long time he lay sleepless, trembling at the narrowness of his escape from the wicked black dogai. Meanwhile, Kawai had discovered the empty platform and guessed that the hunter must have seen her and fled. She soon spied his tracks beyond the rocky point and was already following them when her intended victim had reached his hut. She stood outside awhile, until she judged him to be asleep and then went into where he had laid his harpoon and spear on the ground beside him. By and by, she ate him, leaving only his bones inside the mat. In the morning, the men in the village went to see what luck he had had fishing during the night. ‘Where is your husband?’ they said to his wife, ‘wake him’. So she sent her children to rouse their father. From inside the house they cried frantically, ‘father is dead, he has been eaten’. His wife rushed to the mat and saw the bones inside. Grieving the loss, the villagers of Gebar made a platform to smoke his bones, as is the custom. In the meantime, the elders sat together and began scheming a way they might trick and put to death the evil Kawai. For a long while Kawai could not be sighted by the people of Gebar and soon they became careless. One day, two brothers went fishing on the reef at Walikum, the younger stringing the fish as the elder speared them. On the way home the younger brother, only a small boy, got left behind. Kawai, fearing the mood of the people after her meal, had stayed well away from everyone on the island, but she had, nevertheless, kept an eye on the movements of each and every person from her hilltop cave, Bugan Kula, and she now saw a chance to grab them without anyone being the wiser. So she hurried down to the reef, and assuming the face of the boys’ mother, called to him with his mother’s voice, ‘come my child’. Hearing her, the child ran to her happily. Kawai took him in her arms, raised him to her shoulders and strode off with him back home to her cave. She never permitted the boy to leave the cave, keeping him a close prisoner, but she fed him well the whole time, until he had grown big and strong. One day she said to him, ’not this moon, but the next one, I will kill you and eat you.’ So the boy knew that he must very soon find an opportunity to escape. It came when Kawai went off for three days to dig yams. The moment she was out earshot, he squeezed through the narrow cave opening and ran all the way to the village. He told the elders of his captivity and how the evil dogai had tricked him into thinking she was his mother. The villagers decided to act quickly and put their plan into action. They constructed a ladder and stood it against a tree, high into the branches, where they built a platform for the men to hide. The top two rungs were made to look strong, but were made of fragile wood. The men sat down on the platform, each with bows and arrows beside them. The women hid in the grass armed with clubs. Kawai had only dug up three or four yams when her digging stick broke. After the third digging stick broke, she instinctively knew something was wrong at home and sensed the boy had escaped. Running back to Bugan Kula cave, she became wild with rage and cursed the boy, dressing up in her most frightening manner, picked up a big stick, and ran furiously down the hill to seek him out. The men waiting on the platform could follow her progress, because birds flew up from trees as she reached them. The men called to the others, ‘make ready – the dogai is coming’ and positioned the small boy at the foot of the ladder, armed with a bow and arrow. When Kawai reached the bottom of the ladder she threatened the boy as he moved up the ladder, screeching ‘you ran away, but you will die today, and so will everyone else’. Step by step she climbed the ladder until she put her feet on the two rungs at the top, crashing to the ground. The boy quickly shot an arrow into her heart. All the village women dashed out from their hiding place in the grass and beat the dogai with their clubs and the men bolted down from the tree platform to cut off her head with a bamboo knife. Finally, the people united and rejoiced and made a roaring bonfire, on which they threw the body parts of that wicked black dogai. One cloudy night when there was scarcely any moonlight, some Kaigas Men (shovel-nosed shark totem) of Sipingur killed a crocodile by mistake while hunting for dugong. They took it to the people of Wagaedagam, who burst into tears upon seeing their dead totem, the koedal.They mourned it for many days afterwards. In shame, the Kaigas men of Sipingur vowed to make good their insult to the people of Wagaedagam. So, the Kaigas men canoed to Awailau, harpooned another crocodile, and examining it very carefully, hurriedly returned to Mabuiag, where they constructed a wonderfully large replica of Koedal (crocodile) in turtle shell, so big it could be slipped over a man’s head. When it was finished, the men of Sipingur presented it to Wagaedagam. The people of Wagaedagam dried their tears and danced with their Koedal mask. 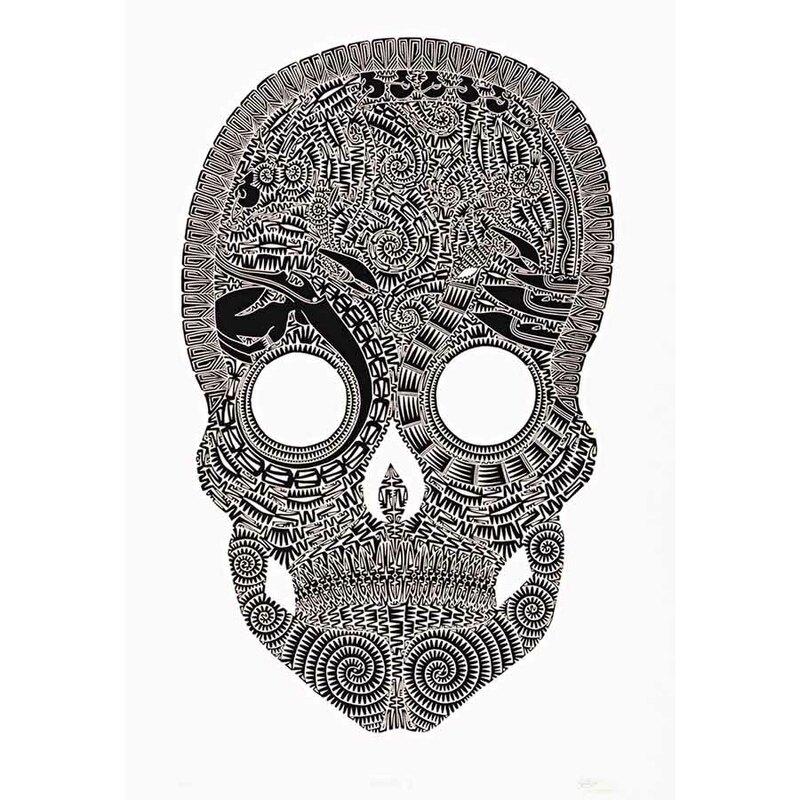 Skulls were the main trading currency used by Torres Strait Islander people with their Papua New Guinean neighbours. These trading skulls were acquired in battle and though raiding parties to other islands and Australian mainland. Longboats were the main trade items needed on islands where tall trees did not grow. 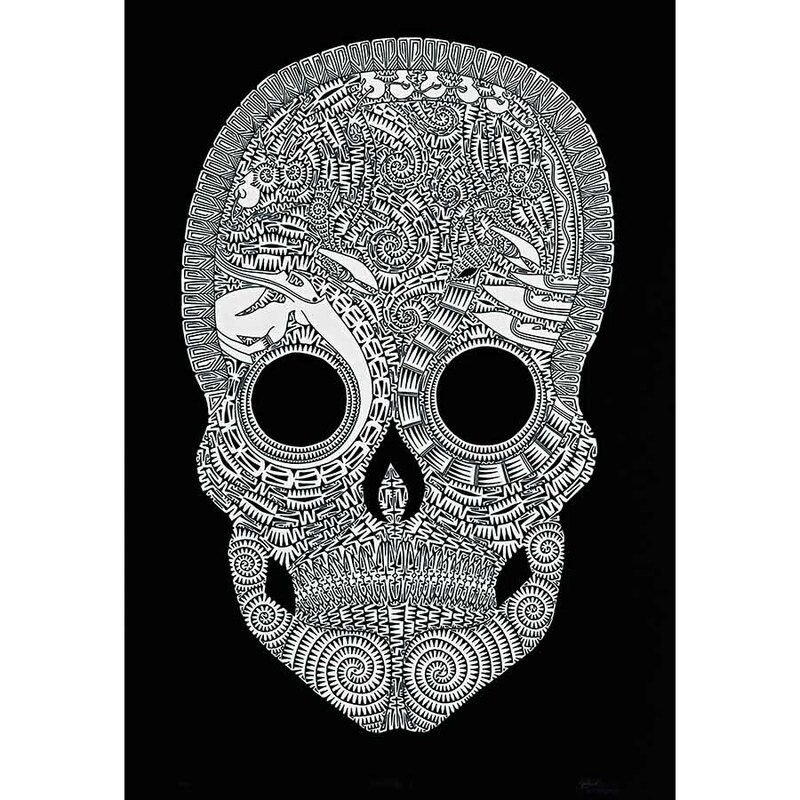 Not all skulls were traded, some were used in ceremonies and rituals. The Hammerhead Shark is my totem and my father’s totem and so we’re not allowed to hunt sharks. This print is about the hammerhead shark’s food sources and its enemies. Under the shark’s belly are the creatures that make up most of its diet - dugong, turtle and stingray, his favourite food. He also eats different kinds of fish. His enemies appear on his back, but his most feared enemy is the tiger shark. The 'S' shape of his body warns you not to come closer. Kursi refers to a school of hammerhead sharks. The word for one hammerhead shark is kurrs. Large schools of hammerheads signifies there’s schools of fish in the area and a change of season is about to take place. In the old days, elders could read into such events that battle was about to take place and might foresee a good outcome. Murai means young or teenage turtle. 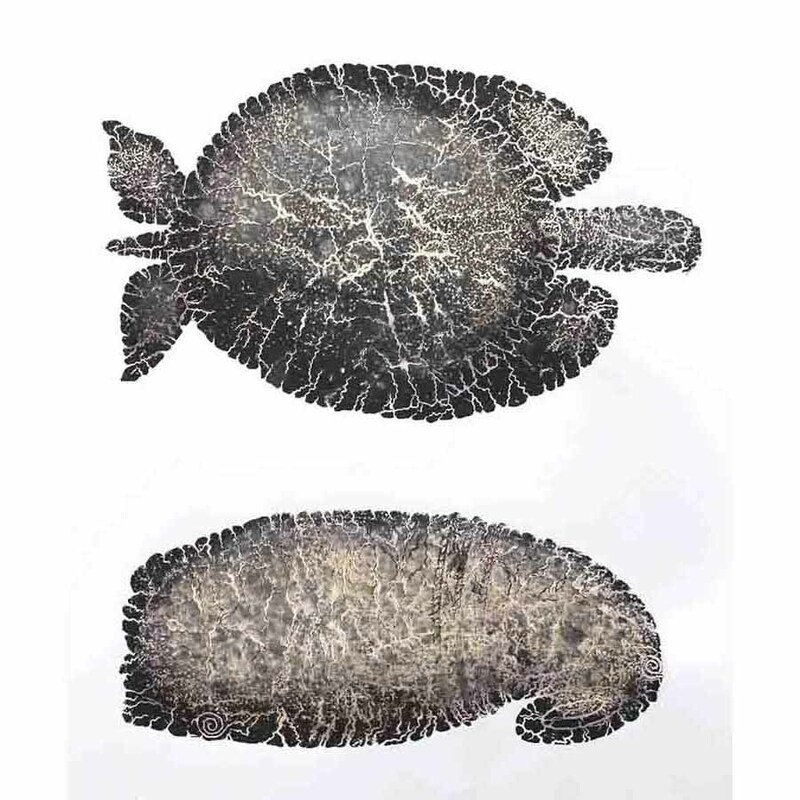 The murai have no barnacles on their back and are not yet fully grown to an adult waru (turtle). Waru is the Miriam word for green turtle. Waru glide over the sea beds, all the sea animals and also its enemies like crocodile and sharks. But now, humans, their fishing nets and their pollution are causing waru a great deal of concern. Oun is the Miriam language word for stingray. It is the augud (totem) of my two daughters, inherited from their mother who is a native of Mer Island. Traditionally, we are not allowed to eat our augud. 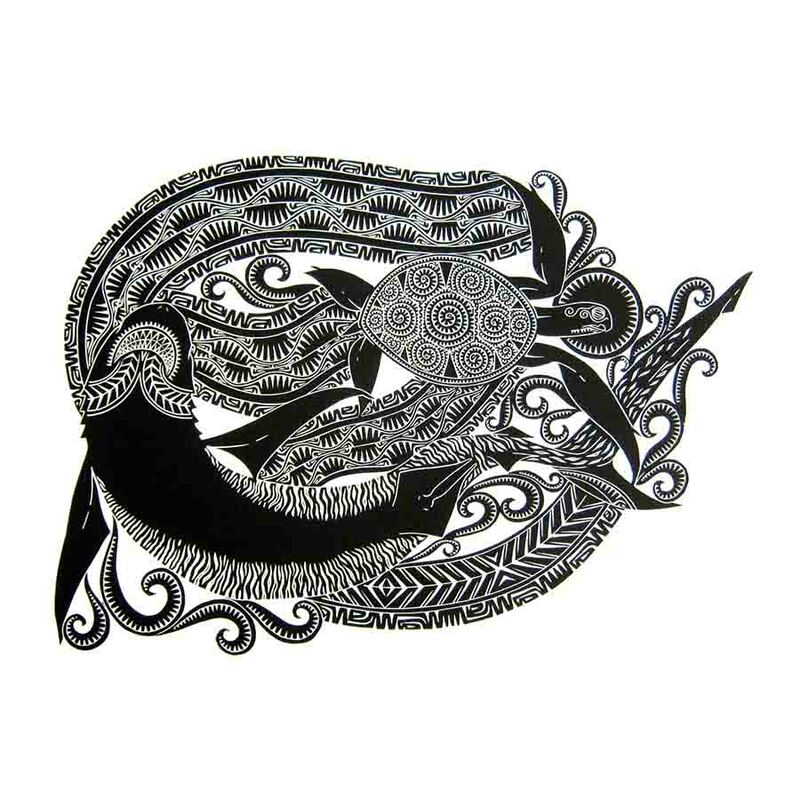 Tabu (snake) is the name of one of the small clans on Iama (Yam) Island and Augud (totem) to some people in the Torres Strait Islands. 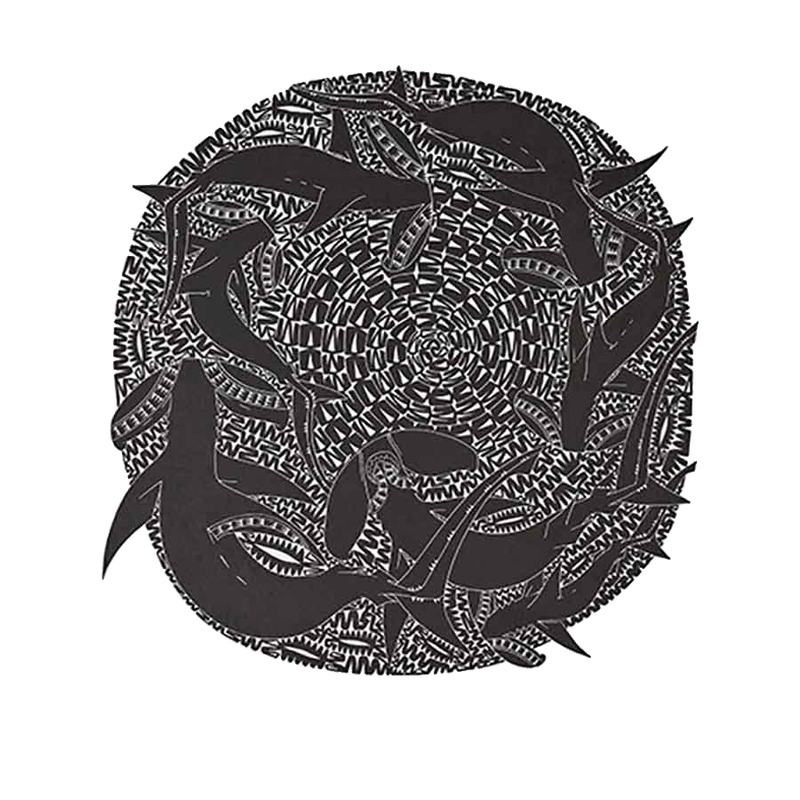 This print is based on how my ancestors used the stars to navigate around the Torres Straits at night, when the reefs and other landmarks were not visible. The crocodile (kodal) carved into the canoe represents our totem. Many years ago, before the coming of the white man, four brothers (bala) named Malo, Sagai, Kulka and Siu made their way by canoe through the Torres Strait to the central and eastern islands from the northern tip of Kay Daol Dai (literally big land) or the northern tip of Cape York. 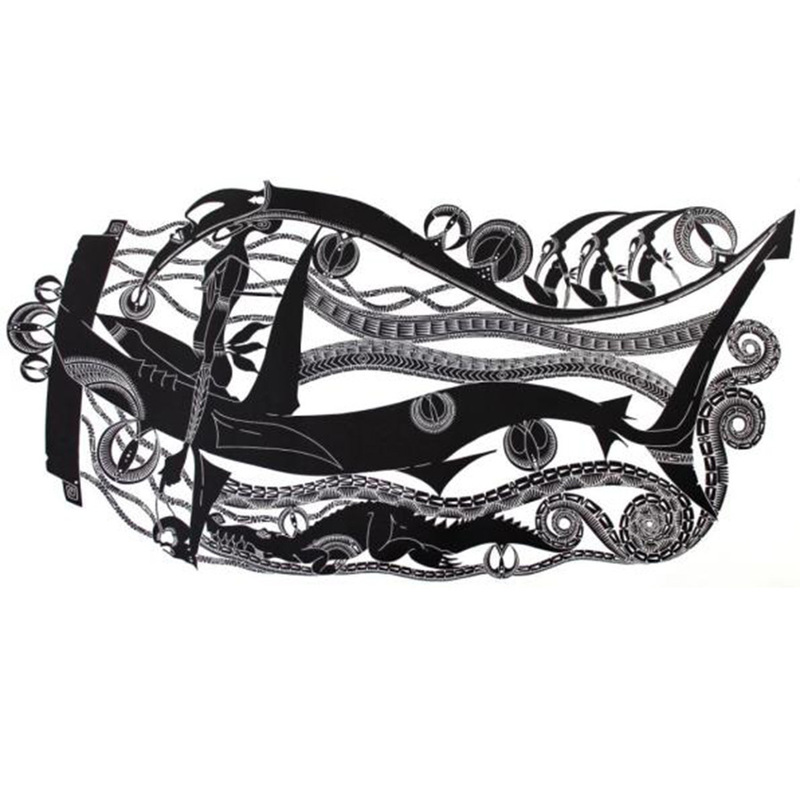 Each was to establish and lead their own tribe, setting down law and creating the unique Torres Strait Islander culture which continues today. Sagai, the second oldest brother of the hammerhead clan totem (kurr) stopped at Iama Island (known as Yam). 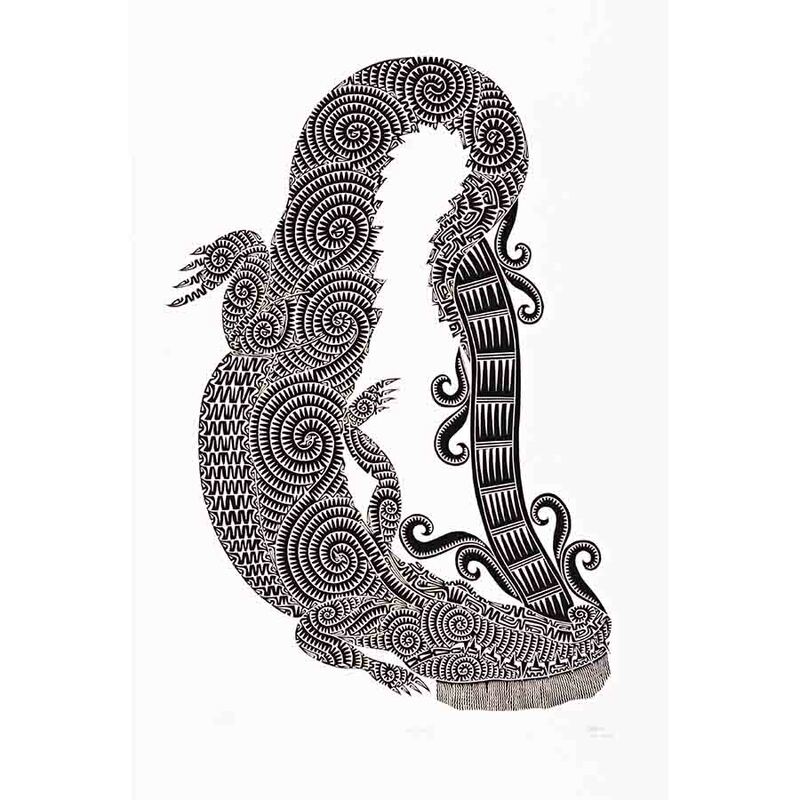 Maiu, his wife from Tudu Island, came from the crocodile clan (kodal). Both islands share the same culture and customs today. Because of his great strength and wit, Sagai was elevated to the status of a god. He taught the young men to fight well and was rewarded by them with the heads of their enemies from warring islands. In my print, the lead warrior is Sagai, followed by his brothers. The hammerhead shark and crocodile totems and round symbol of the hammerhead shark totem are represented. Kulka was the second bala to leave the group, remaining at Aurid Island (Auree). 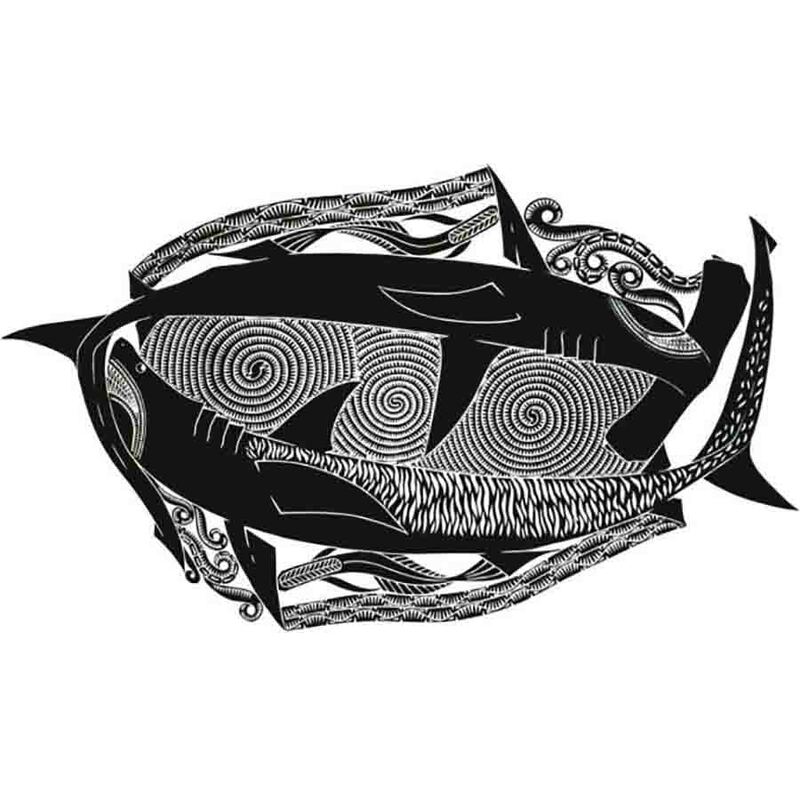 He became the god of hunting, adopting the fish totem gai gai (Trevalley). 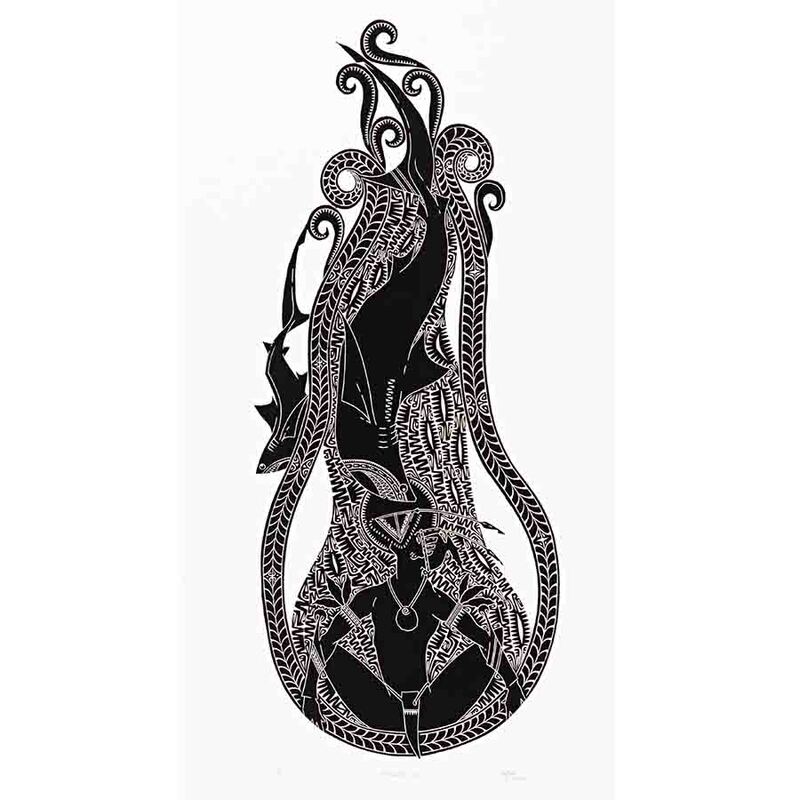 Siu, the third bala, went to Masig (Yorke Island) and became god of dancing. He adopted the tiger shark totem (baidam). Malo, the eldest bala went to Mer (Murray Island) and became the god of religion and law, creating a strict set of rules, not unlike the ten commandments introduced in 1878 by missionaries (now celebrated as ‘the coming of the light’). These same rules were presented as evidence by Eddie Mabo to the Supreme Court in his now famous land rights case for his people. For this, Malo adopted as his totem sugu (the octopus). There were once four brothers, Malu, Sigai, Kulka and Sau. Each of them was a powerful man, well-versed in magic. Sigai went to Iama (Yam) Island. He took on the form of a Kurrs (Hammerhead shark) and became the God of War. Main is Sigai’s wife - she is the Kodal (Crocodile). In this image you can see all the animals in the small clan on Iama Island, like the Sam (Cassowary), Umai (Dog), Ger (Sea Snake), Tabu (Snake), Gaynaw (Torres Strait Pigeon). All the small clans were under Sigai and Main. My father was from the Kurrs Clan and the hammerhead shark is my augud (totem). The story about the two bala is a very old one from Iama (Yam Island). One day the big bala asked the small bala 'would you like to swim like a shark?' 'Yes, I would like to' he replied. So they jumped in the water, but as they did so, the big bala turned into a tiger shark and bit him, killing him instantly. His body was carried by the tide and turned into a big rock that sank to the bottom of the sea on the edge of the reef. As his punishment, the older bala was forever a tiger shark. So whenever you go to fish in that area, there’s always tiger sharks swimming around and you can still see the small bala at the edge of the reef. Under the surface we are all the same though racism lurks everywhere. Waru is the Miriam word for green turtle. I made this design thinking of how my life is like the waru, a continuous journey, going up and down all the time. Waru glide over the sea beds, all the sea animals and also its enemies like crocodile and sharks. But now, humans, their fishing nets and their pollution are causing waru a great deal of concern. Before setting out on a hunt, men would rub turtle oil on the doiom (stone) to give them zogo (power) and good luck for the hunt. Instead of looking for the waru (turtle), the waru would come to them. The stone remained on the island and was never moved otherwise there would be no turtles caught. Wherever the turtle stone faced, that was the direction where the turtles were. The womer or frigate bird sends a sign to us when the sager (south-east) wind is blowing. The frigate bird travels in groups gliding high in the sky. They are fish eating birds which are expert hunters. Sometime elders would tell us to stop their migratory pattern so the sager wouldn’t come, blowing often with winds reaching up to 35 knots. Hunting, fishing and especially pearling and diving for beche de mer cannot be done when these wild winds blow. If we’re lucky they blow for just a week but sometimes they continue for up to a month. Glen has a distinguishable bold style featuring wonderfully threadlike lines. He explains that he has been elected as Yam Island’s ‘official’ storyteller. His mission is to keep alive the sacred stories of the four brothers who travelled from the north before memory and settled at Zenadh Kes, or what most Australians know as the Central and Eastern Torres Strait Islands. In Glen’s works, art and law are combined heroically – the figures are woven into rhythmic patterns of design. 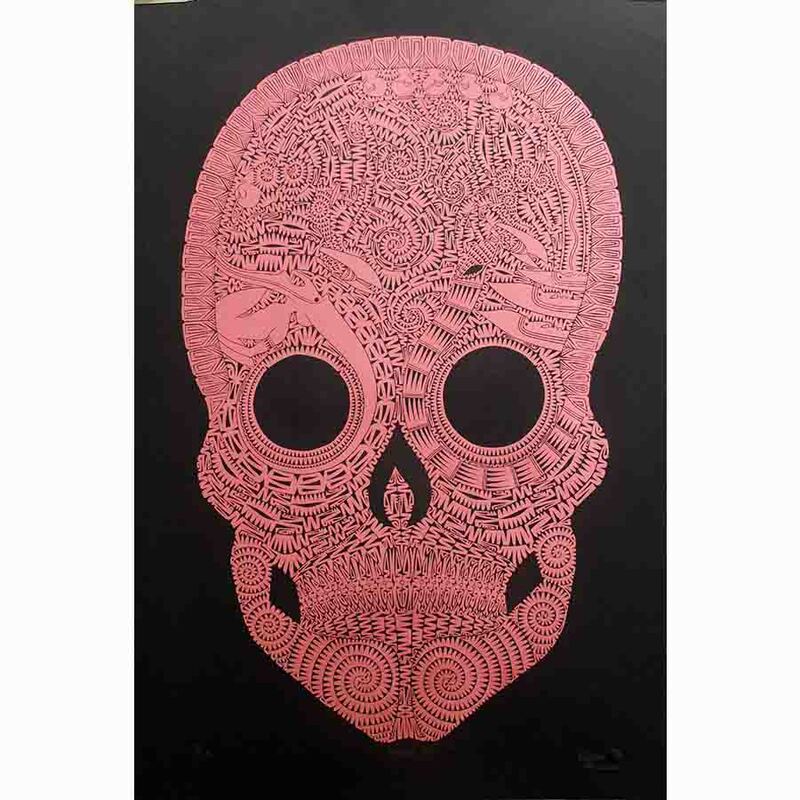 Paintings, prints and sculpted objects by Glen are held in many private collections throughout Northern Queensland. 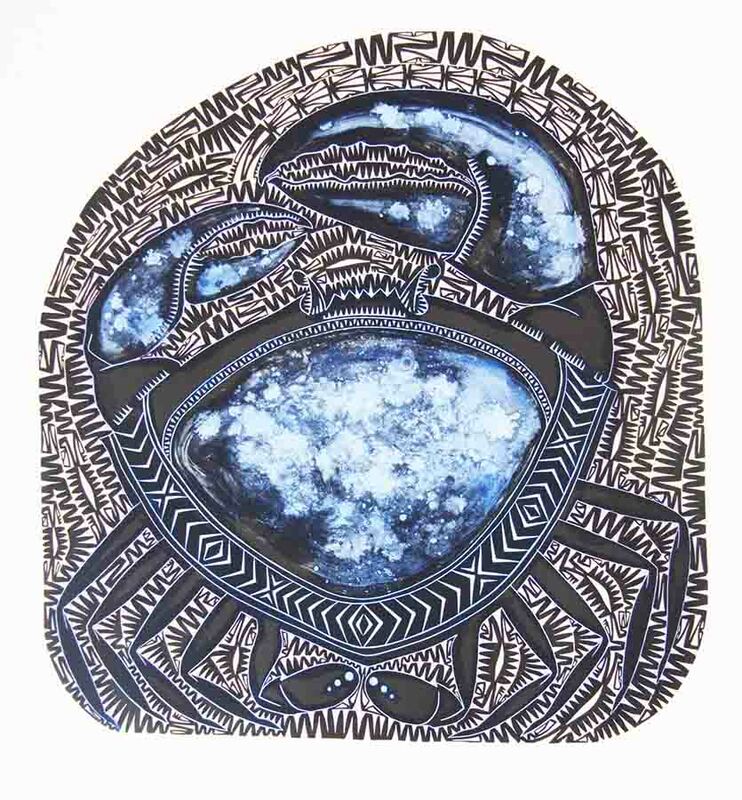 1998-99 TAFE, ATSI Diploma of Visual Arts Course, taught by Anna Eglitis and mentored by Dennis Nona. CIAF (Cairns Indigenous Art Fair) Exhibited by Sun Dance Gallery, Port Douglas, Hogarth Galleries, Sydney and Fireworks Gallery, Brisbane. 1999 Exhibition with Nino Sabatino at Banggu Minjaany Art Gallery, TNQ TAFE, Cairns, curated by Barbara Adams.